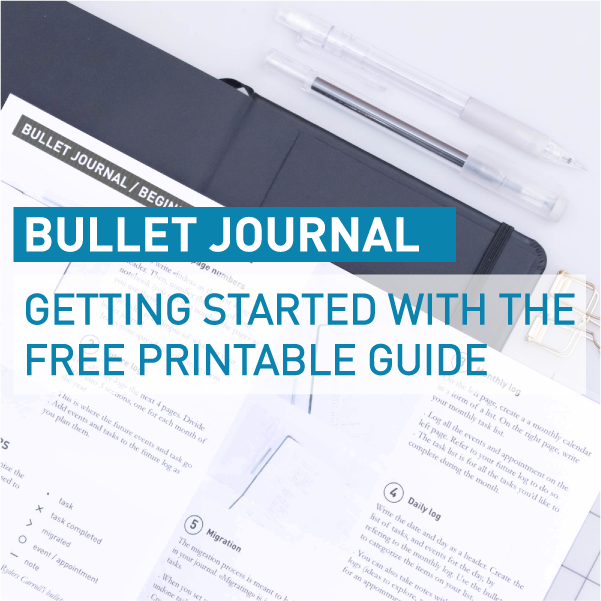 It’s been a while since I gave you a full tour of my bullet journal and planning system…And let me tell you that there have been major changes in my planning system since January. Now that we’re almost halfway through 2018 (I just can’t believe it), it’s time that I show you the tools I’m using for project management and what my planning routine looks like. Disclosure: long post ahead, but I hope it will answer most of the questions I regularly get about my planning system. 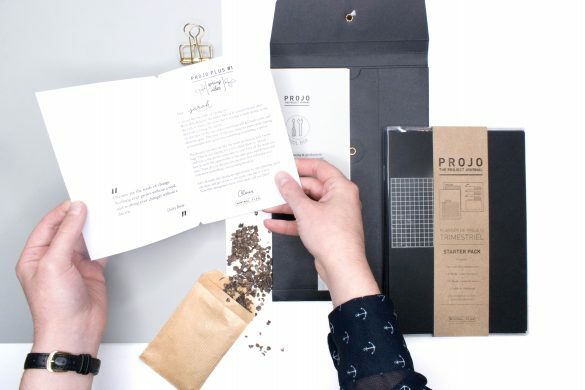 If you’re in a hurry and want a short version of this full review, go straight to the end of the post for a quick sum up and go back and forth to get details about my project management strategy, my daily planning routine, and the whys. 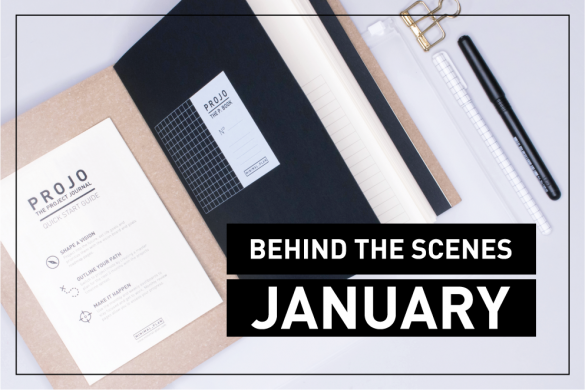 And if you want to go back in time and see what my planning system looked like in January, check my 2018 set-up post! I always have several projects going on, may them be personal or work related. The amount of them has been growing lately as I recently took more commitments in my personal life and changed work to become a full time freelancer. To run everything as smoothly and efficiently as possible, I switched from an all analog project management system to a digital based one. 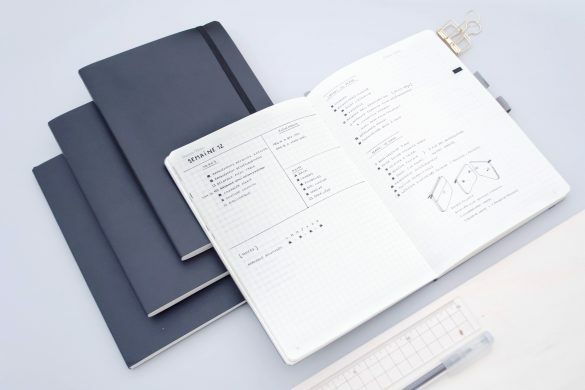 Going digital for project management allows me to move tasks and deadlines much more easily than when I was using pen and paper only to plan my projects. 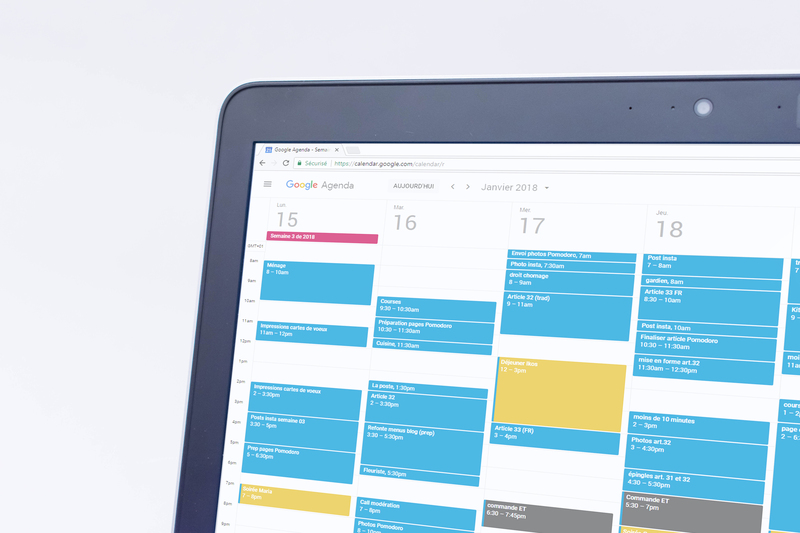 I rely on 2 digital tools to manage my projects efficiently: Google spreadsheets and Trello. 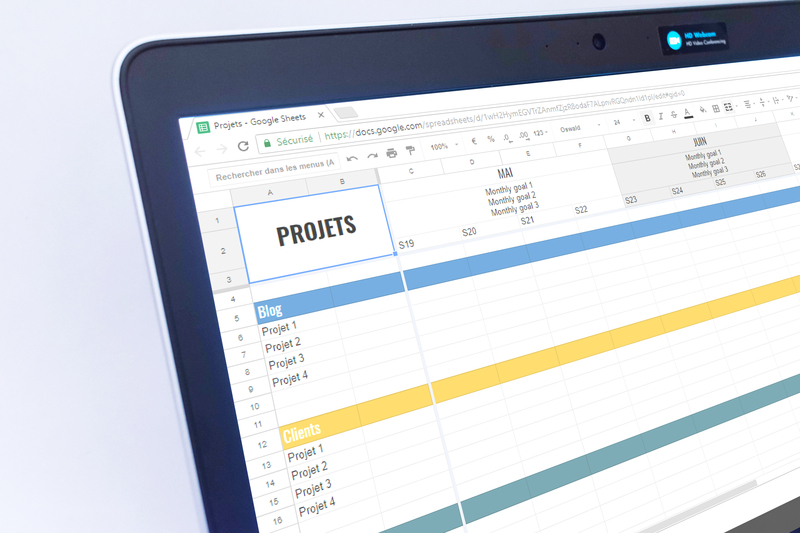 I use the Google spreadsheet tool for project management. I only have one sheet that centralizes all the projects and tasks I need to plan. My “Projects” Google spreadsheet is my dashboard for all the projects I’m running and the ones coming in the future. I created it after reading David Allen’s Getting things done and it has become in a few weeks a cornerstone of my project management system. I was already having something similar to this dashboard when I was working as a project manager and even though I don’t really need to share tasks and deadlines anymore, it’s been a huge improvement to my planning system. I still wonder why I didn’t think of creating it earlier! This “Projects” spreadsheet is basically a table with all the projects I have on hands at the moment: the first column holds my project list (organized in categories such as blog, partnerships, personal projects…), and the first line is for my monthly goals and the second one holds a weekly calendar. I end up with a weekly task list that I then migrate in my bullet journal weekly log for daily management and review. This dashboard is pretty simple but works like wonders. 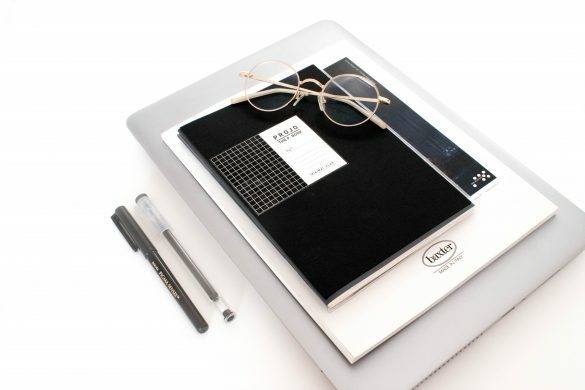 It keeps me accountable on all the projects I want to achieve. Going digital for project management has really improved the efficiency of my system. 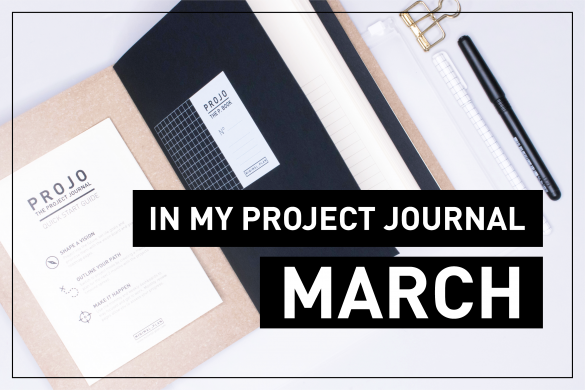 My projects are all in one place and no more dig up in the pages of my bullet journal. 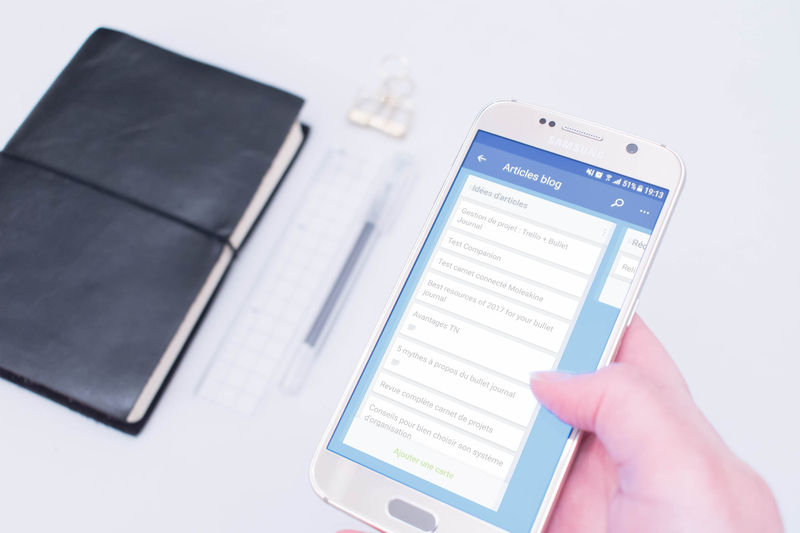 The second digital tool I use for project management is Trello. 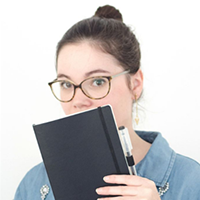 I use Trello to track my progress on blog posts and content creation. Trello is a project management tool inspired by the Kanban board method. I’ve break down the process of creating a blog post in several steps and have labels for all the blog posts I’m currently working on and the ones I’d like to write some day. I use the both the Trello app and the desktop version. When I have a blog post idea, I log it in the first column of my Trello board. 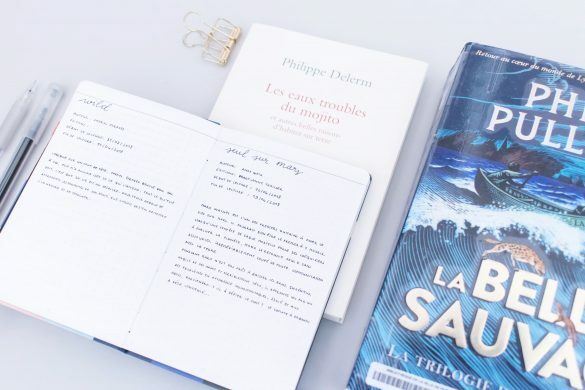 Once I scheduled it in my editorial calendar, I move the label to the “writing” column and so on until the label reaches the last column, which means that I completed the process (blog post is live and has been shared on social medias). I review my Trello dashboard once a week. I take 5 minutes to update it and move labels as needed according to what I decided to do during my project management dashboard review. All the tasks I need to tackle are then migrated into my bullet journal. I don’t use the future log of the bullet journal system. Even though I tried hard to make it work for me, I always end up to go back to Google calendar: it’s available on my phone, and I don’t have to pull my bullet journal out of my bag each time I want to check on it or add an event. I also use the desktop version of Google calendar to manage my time with the time blocking method when I have a lot going on. My monthly log is divided into 2 sections: a monthly goal spread and a calendar for events and appointments. 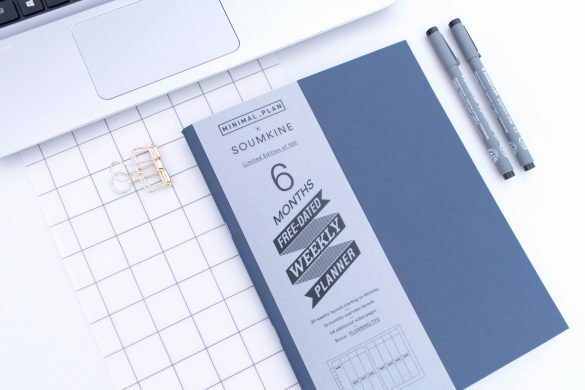 The monthly goal spread is a table that helps me set realistic goals for the month ahead, break them down into smaller tasks and to assess progress on them. 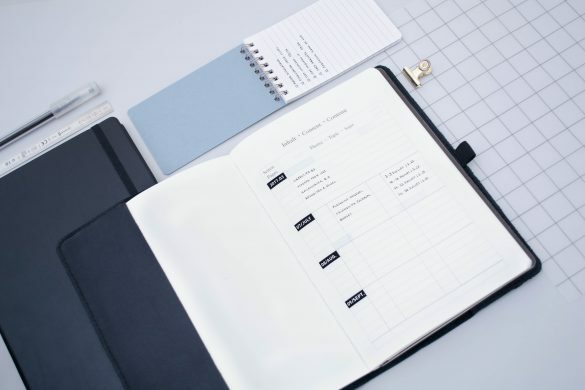 On top of the meetings and appointments planned for a long time, there are all the events that I plan one day for the next: dinner or lunch with friends, Skype calls with clients… A lot of things happen that weren’t necessarily planned in my monthly log. Once the week comes to an end, I log these past events in my monthly log to keep track of them for easy future reference. 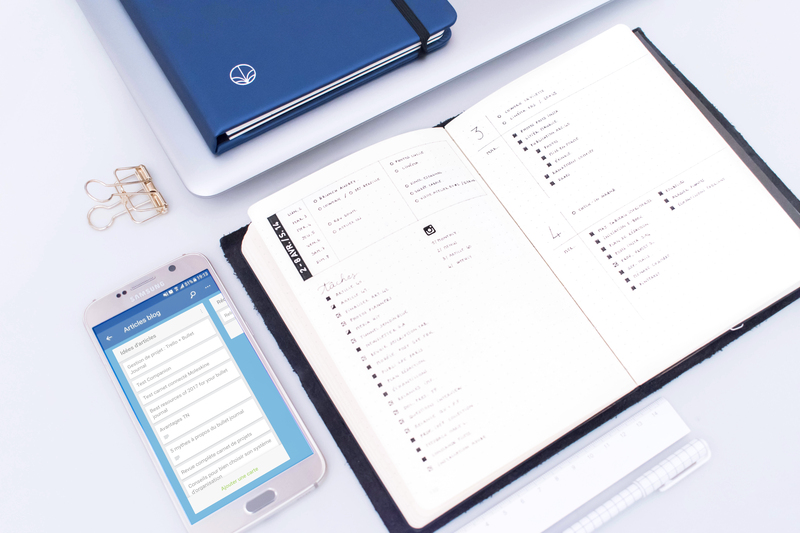 My weekly log helps me to track tasks and events, and is basically an overview of my week. My daily logs feature, just like my weekly layout, a section for events and appointments, and a to do list. 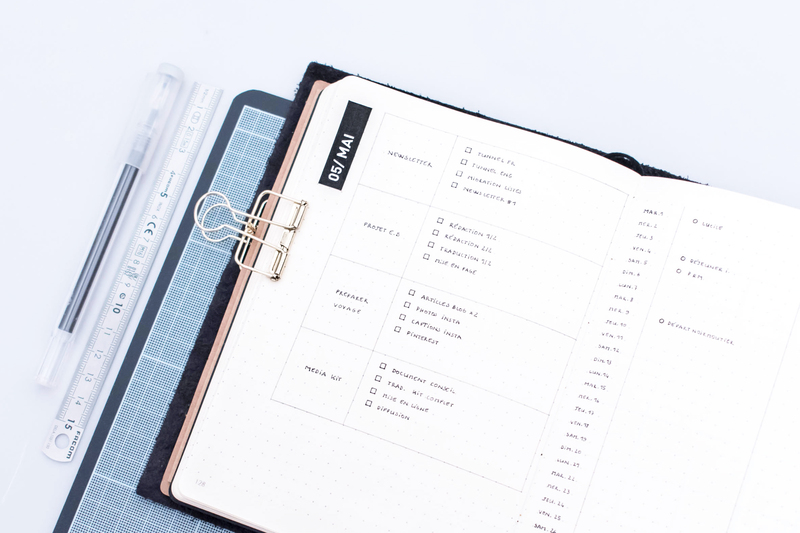 This weekly + daily combo allows me to assess progress on the weekly task list migrated from my project dashboard, and help me to stay on track on chores and small things to do. , I better understand why I need it: it acts as a second brain. You could see it as a messy version of what’s inside my bullet journal. I review it on a daily basis to migrate it’s content in either my bullet journal or project management dashboard. Last but not least comes my Minbok discbound notebook. It has become in a few weeks a true game changer for everything work related. I carry it with me wherever I go and scribbles meeting notes and ideas in it. 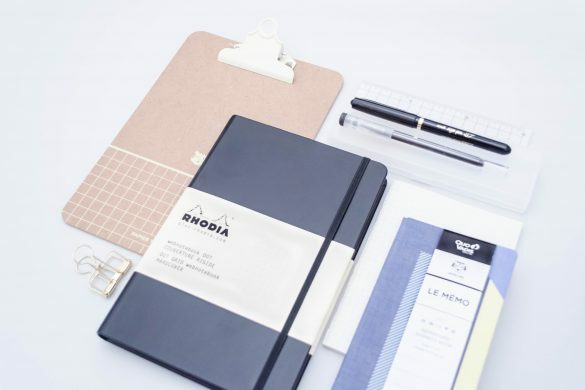 The disc binding is perfect as it allows me to easily take notes, move pages around and organize my notes by projects once the day is over. 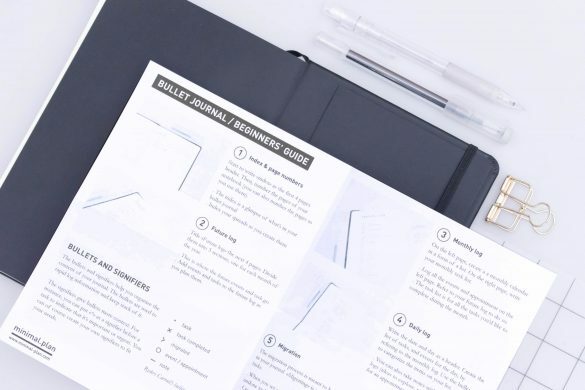 If you want to have a closer look at how I take notes, you can check my “Beginners’ guide to effective note taking” post! My planning system may seem a bit complicated for someone who tries to be as minimalistic as possible. I realise that the wish I made at the beginning of the year to use my bullet journal as my one and only tool to manage everything was way too optimistic. Because I strongly believe that a picture worths a thousand words, I summed up the tools I use and my planning routine in the scheme below. My planning system and the project management tools I’m using are constantly evolving. I’m still trying to figure out the perfect planning system to fit my freelancer routine, but this digital + analog combo works pretty well so far. I can have a summary of all the projects I’m running at a glance and easily manage the related tasks in my bullet journal. Now the main issue I’m facing isn’t really to keep my system up to date: my lack of focus and self discipline is definitely what’s holding me back!